Folks have been gliding on skis for centuries, first as a means of transport, and only very recently, in the name of recreation. Nordic peoples invented skis in prehistoric times. In fact, one of the earliest written mentions of ski touring dates back to the year 1555, when Historian Olaus Magnus wrote a description of Norwegians attaching long skis to their feet, and fawn skins to the bottom of the skis. These early skins provided traction on uphill climbs, "because the hair of the skin will rise like spears, or Hedg-Hog Bristles, and by an admirable power of nature hinder them from falling down." Much later, in the 1800's, Snowshoe Thomson, a Norwegian living in California would begin his 20 year career as a mail carrier, delivering the mail on 10-foot skis, weighing about 25 pounds over the Sierra Nevada Mountains. His trips lasted 5 days, and took him over truly treacherous terrain carrying an 80 pound sack of mail. What started as a practical tool, soon became used for adventure and exploration. 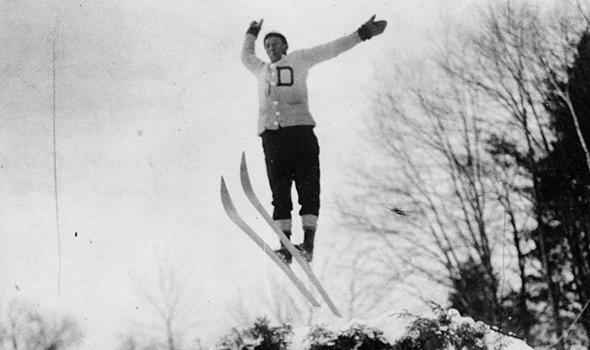 Dartmouth College formed an outing club, whose members would log many first ascents (and subsequent descents) in the early 1900's. These enthusiasts formed a passionate community of Alpinists, whose legacy looms large on the history of East Coast skiing and mountaineering. In 1934, the first rope tow was installed at Suicide Six in Vermont. The first proper chairlift followed shortly thereafter, installed in Sun Valley in 1936. No longer were skiers forced to hike for their turns. Skiers flocked to resorts, where advancements were being made in snowmaking, ski design, and chairlifts were providing easy access. Backcountry skiing in most circles of the United States took a backseat, while touring remained prominent in Europe. Recently though, touring has made a massive comeback (some will say it never left). Perhaps owed to the rise of ticket prices, and increased crowds, or Alpinist's never satiated desire for fresh powder, alpine touring in the side or backcountry is once again au courant. Meditative and physical, we're drawn to touring for the escape it provides from the hustle and bustle of the resort. Providing a more intimate way to interact with the mountains, and nature itself, touring is a simple pursuit that brings with it such joy and fulfillment. With only your breath, and perhaps the chatter of friends in your ears, and a hot thermos of coffee stowed in your pack, this is the best way to experience skiing. Our newest collection is lightweight and packable, designed to perform in any season while traveling up or downhill in the alpine.